Sister Rahab Nyaguthii has a hard life. She doesn’t have much money, and she’s compelled to farm and engage in other hard labor in order to do what she wants to do. What she wants to do is to help young mothers. Nyaguthii is from Eldoret, Uasin Gishu County. She is referred to, quite appropriately, as “Mama”. That’s because she extends motherly love to young mothers everywhere she can. Typically, these young mothers have dropped out of school as a result of early marriages and pregnancies. They have a hard life, often with a dismal future. They need help. But Nyaguthii does more than express sympathetic emotions: For the past eight years, she has sought out young mothers and helped equip them with culinary skills at St. Brendan Technical Institute. These skills help the mothers become marketable in the catering and hospitality industries and be able to provide for their families. Nyaguthii continually raises funds to keep the mothers in school and purchase what they need for their studies; that is why she farms and rears chickens and performs other tasks that most women in her position would not have to do. For her, the work, no matter how back-breaking, is worth it. Sister Rahab Nyaguthii gives hope and encouragement to young mothers. She gives them a second chance to be successful. 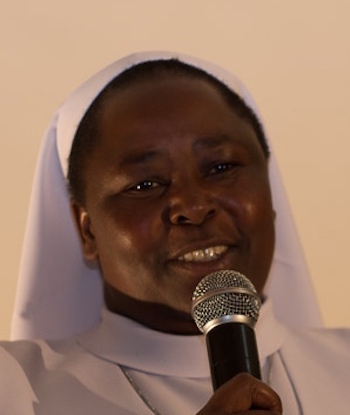 And that in turn gives meaning in life to Sister Rahab Nyaghuthii.